(CNN) -- The leaders of Europe's two most important economies meet Tuesday to try to help the battered euro, even as new figures show economic growth on the continent is stalling. 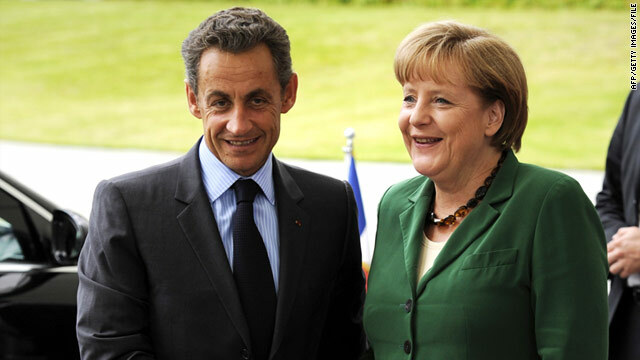 German Chancellor Angela Merkel is in Paris to meet French President Nicolas Sarkozy. Shortly before the meeting, Germany's statistical office announced that growth in the continent's biggest economy was just 0.1%. The euro is the common currency of 320 million people across 17 countries in Europe. Many countries in the zone are struggling with staggering budget deficits and weak economies, putting the future of the currency in doubt. Analyst Gary Jenkins of Evolution Securities said he expected little from the French-German meeting. "I guess there will be the normal statement that they are fully committed to the euro," and that they will take action to stabilize the markets, he predicted. He doubted that they would propose a common European bond -- a potential way to lend strength from more robust economies on the continent to weaker ones. "Although ultimately I think that is a high probability outcome. But not for today," he said. French media reported that the two leaders may propose tougher rules for national budgets and deficits. The treaty that created the euro put a limit on the size of the deficit member countries could run, but those limits are being widely flouted. The weakness of the French and German economies may limit Sarkozy and Merkel's ability to act. France, the second largest EU economy, reported last week that activity stalled in the second quarter. GDP in the eurozone grew by 0.2% in the second quarter, Eurostat announced Tuesday, as Germany announced its own 0.1% figure. Analyst Chris Williamson called Germany's growth in the second quarter "a major disappointment." "The weak data for Germany follow recent numbers showing zero growth in France in the second quarter, and raises concerns that the euro area's hitherto strong core countries are undergoing a much deeper than previously thought soft-patch," said Chris Williamson, chief economist at Makrit in London. He warned that the current situation echoed the eurozone's 2008 slide into recession. CNN's Nina dos Santos in Paris and Irene Chapple contributed to this report.